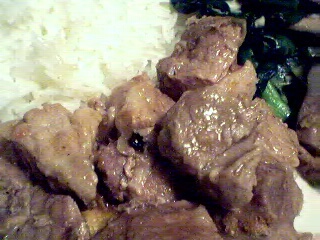 As a change from the usual adobo, and again borne out of necessity of wanting to cook something different but not having the right ingredient to follow any recipe on hand, this braised pork was created. Put all ingredients in a pot with just enough water to cover the meat and simmer until tender and almost al the liquid has cooked out. About 1 hour and a half. Adjust seasonings and serve with rice and vegetables of your choice. Our vegetable of choice just happened to be lightly sauteed mustard greens. that is nice.. hmmm looks delicious!!! It’s nice to use a simple recipe and play around with it to come up with a new and tasty food! I iska! glad to hear you are now able to comment 🙂 although, your emailed comments were always a nice change. hello! this is similar to my 1st attempt at cooking beef pares. d successful as beef pares pero delicious nonetheless. A great invention. Simple and easy to cook yet sounds delicious and it looks great. I love the taste of mustard greens.